TNPSC Recruitment 2019: Tamil Nadu Public Service Commission is going to fill up 49 vacancies in Tamil Nadu Medical Service. Recently it has released the recruitment advertisement for Drugs Inspector & Junior Analyst Posts. It invites online application from eligible candidates for above said posts. As per the TNPSC 2019 recruitment notification, these 49 vacancies are allocated for DI & JA posts. Applicants who are seeking government jobs in Tamilnadu can use this chance. Qualified aspirants can apply to this recruitment through online from 12.04.2019 by using TNPSC login. The last date for submission of online application is 12.05.2019. TNPSC notification and apply online link is available in official website. TNPSC will conduct the written examination followed by oral test for selection of suitable contenders. After that selected aspirants will be appointed on anywhere in Tamil Nadu. Applicants must have possessed Degree in relevant disciplines from recognized university. Candidate should have minimum 18 years and maximum 30 years. Applicants have to pay required fee through online or offline. Applicants should submit online application only no other modes of application will be rejected. More details of TNPSC admit card, exams, results, exam date, merit list, upcoming TNPSC notifications, latest vacancies and etc. are available in official website. Tamil Nadu Public Service Commission shortly TNPSC is a state government agency which is responsible for recruitment of staffs in Tamil Nadu. State public services recruits for various departments such as Revenue Department, Forest department, medical services, public services and etc. Formerly, the commission was called as Madras Service Commission. It has been servicing to Tamil Nadu since 1929. Headquarter is located at Park Town in the city Chennai which is the capital of Tamil Nadu until now. The recruit staffs every year by the way of Written Exam, Interview, Physical Test and Document Verification. You may visit TNPSC Portal to get more details about this recruitment. Here you will get information like educational qualification, age limit, application mode, fee and how to apply. Keep check Daily Recruitment regularly to get latest updates. As per the notification, totally 49 vacancies are allocated for this recruitment. Post wise vacancy details and salary details are given below. Applicants must have possessed Degree in relevant disciplines from recognized university. Candidate should have minimum 18 years and maximum 30 years. TNPSC will select the aspirants on the basis of written test and oral test. Online applications only will be accepted. Candidate can deposit the fee through either online (net banking, debit card and credit card) or offline (SBI/ Indian bank). Go to official website tnpsc.gov.in. Click “Notification” find the advertisement number “15/2019”. Click on the advertisement notification will open read it and check eligibility. To apply click “Apply Online” enter your details correctly and make the payment through online. Applicants who have fulfilled the above eligibility, those candidates can apply to this job easily. Do not miss the wonderful career opportunity in TNPSC. Aspirants kindly watch this page regularly for upcoming changes in TNPSC job 2019. For more accurate information about this TNPSC job notification, check their official website. TNPSC Recruitment 2019: Tamil Nadu Public Service Commission (TNPSC) has announced job notification for recruitment of Assistant Training Officer (ATO) and Laboratory Assistant vacancies. There are 14 vacancies are allotted for above said jobs. Willing and eligible aspirants may apply to these jobs through online mode on or before the last date of 20th May 2019. Download job notification from TNPSC official website of tnpsc.gov.in. The last date for submission of online application from 19th April 2019 to 20th May 2019. Candidates should have completed prescribed age limitations and educational qualification. TNPSC may conduct the following selection process like, written examination and oral test. Make the fee payment through online mode or offline mode till the last date. SC/ ST/ SC Arunthathiyars, Differently Abled Persons and Destitute Widows of all communities are exempted from fee. Selected candidates shall be engaged at anywhere in Tamil Nadu. 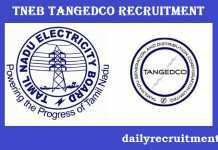 Who wish to apply for Tamil Nadu Public Service Commission (TNPSC) Recruitment vacancies can log in/ visit their official website to collect more details like, Syllabus, Admit Cards, Results, Upcoming Vacancies & etc. Degree/ Diploma/ equivalent from any recognized university/ institution. For ATO: Maximum age limit is 35 years. For Laboratory Assistant: Maximum age limit is 30 years. Online Mode – By Net banking/ Credit card/ Debit. Offline Mode – By State Bank of India/ HDFC Bank. Go to TNPSC official website -> tnpsc.gov.in. Click on option -> Notification. Find the correct notification “14/2019 & 13/2019” and open it. Read the notification correctly to check your eligibility for TNPSC jobs 2019. TNPSC Recruitment 2019: Tamil Nadu Public Service Commission is going to fill up 89 vacancies in Tamil Nadu Information Technology Service. Recently it has released the recruitment advertisement for Assistant System Engineer, Assistant System Analyst, Account Officer (AO), Chemist, Junior Chemist, Curator, Asst. Geologist, Asst. Geo-chemist & Various Posts. It invites online application from eligible candidates for above said posts. As per the TNPSC 2019 recruitment notification, these 85 vacancies are allocated for above said posts. Applicants who are seeking government jobs in Tamilnadu can use this chance. Qualified aspirants can apply to this recruitment through online by using TNPSC login. The last date for submission of online application is 20.02.2019 (ASE & ASA), 24.02.2019 (for Curator), 27.02.2019 (for AO), 06.03.2019 (for Chemist), 11.03.2019 (geologist & Geochemist) & 15.03.2019 (Asst. Superintendent). TNPSC notification and apply online link is available in official website. TNPSC will conduct the written examination for selection of suitable contenders. After that selected aspirants will be appointed on anywhere in Tamil Nadu. Applicants must have possessed engineering or pg or graduate in relevant disciplines from recognized university. Candidate should have minimum 21 years and maximum 35 years. Applicants have to pay required fee through online or offline. Applicants should submit online application only no other modes of application will be rejected. More details of TNPSC admit card, exams, results, exam date, merit list, upcoming TNPSC notifications, latest vacancies and etc. are available in official website. As per the notification, totally 89 vacancies are allocated for this recruitment. Post wise vacancy details and salary details are given below. Applicants must have possessed Engineering/ Master‟s or Honour‟s degree/ CA/ Post Graduate Degree/ M.Sc/ B.A in relevant disciplines from recognized university. For ASE & ASA: Candidate should have minimum 21 years and maximum 35 years. Check notification for curator, Chemist, Assistant Geologist, Assistant Geochemist, AO & Assistant Superintendent posts age limit and relaxation. TNPSC will select the aspirants on the basis of written test and other eligibility criteria. Registration Fee: All the candidates should pay Rs.150 for registration (if you had already paid the registration fee, need not to pay again. Click “Notification” find the advertisement number 05/2019, 06/2019, 07/2019, 08/2019, 09/2019 & 10/2019. I am only 12th .can I apply for AAO? I’m interested in this job but i stay at mumbai. can i apply for the job?